Midnight Military Time – 2400 or 0000? Curious about the conversion of 2100 military time? If you are just here for a quick answer, then the equivalent standard AM/ PM time is 9 PM. If you are interested in learning how to convert military time as needed then read on. Below you will find a walk through that shows you how to do simple calculations that will start you on the path of a military time conversion genius! Converting military time is easiest to learn if you separate the day in the time BEFORE NOON and the time AFTER NOON. Once standard time reach 12:00 PM (1200 military time) it becomes a little more difficult to translate into military time. That being said, if it is 2100 military time or “twenty one hundred hours”, simply subtract 1200, add a colon between the hours and minutes, and attach a PM to the end. You add a PM to the end of any military time 1200 or greater. What is 2100 Military Time in Regular Standard AM/PM Time? A great tip to commit to memory: Anytime you wish to convert military time to standard time that is after 12 PM(noon or 1200), simply subtract 1200, add a colon in between the hours and minutes, and add a PM after it. Math not a strength of yours? Consider this resource to help. So, you know what time it is. But, do you know why? 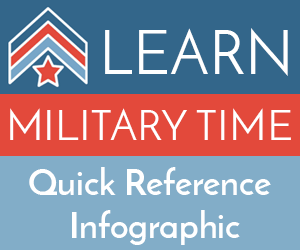 For a full breakdown of how to learn military time take a look at our military time guide. If you want to convert another military time or a standard AM/PM time back to military time you can do so using our tool to convert military time on the fly. This site has a wide array of resources to help you to learn, pronounce, read, convert, and tell military time. Copy and Paste this code into your website!